Home remodeling project preserves legacy of iconic NW architect Bill Fletcher through collaboration of MKM Architecture, Vida Shore Design, and Portland & Seattle remodeler Hammer & Hand. Great attention to detail and a high level of craftsmanship from the remodeling team ensured that the iconic design and architectural heritage of the home wasn’t compromised. Portland and Seattle remodeling contractor Hammer & Hand announced today the completion of a master bathroom remodeling project in a Bill Fletcher-designed Portland home. Collaborating with Mary Hogue of MKM Architecture and Vida Shore of Vida Shore Design, the remodeling team was tasked with preserving an architectural aesthetic iconic to the Pacific Northwest. In the early 1960’s, Portland’s own William Fletcher and his “14th Street Gang” of architects began designing homes and buildings that would come to define the Pacific Northwest Landscape. Known for their use of materials indigenous to the region, exposed lumber, and leverage of natural light, the buildings are designed to become part of their natural surroundings rather than being built on top of them. As the remodeling team began fully exposing the beams in the bathroom, they faced the challenge of matching the finish of the newly exposed beams with the existing beams. 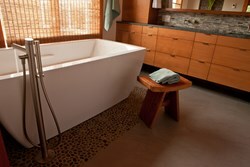 Learn more about Portland home remodeling services by visiting Hammer & Hand’s website at (http://www.hammerandhand.com/residential-remodel). Hammer & Hand is a construction company dedicated to inciting evolution in building through service, science and craft. The firm collaborates with clients and architects to build the best of the Northwest, from new custom homes, to residential remodels, to commercial renovations.